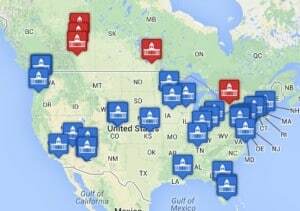 To find your local permit laws, click here. Something small like a horizontal or vertical shed doesn't usually need a permit, whereas a 12×12 shed (or larger) will. Every municipality (whether a township, county, city etc.) differs in their rules for sheds (aka Accessory buildings). It is recommended that you familiarize yourself with your local regulations. WE HAVE A MAP TO MAKE THIS EASIER, HERE. Although local governments have different rules and regulations regarding sheds, they all have commonalities. We have picked the most common for an easy to read guide on what to look for in your council regulations. Every City or County has a limit on size, usually in square feet. The average limit is around 100 sq ft. (10×10) to 120 sq.ft (12×10). Building sheds on an easement (underground pipes and infrastructure), or too close to a boundary or another building is a No-No. Minimum distance from fences and other buildings is typically around 3ft. This includes any guttering or eves overhanging your shed walls. So we recommend that you give yourself some extra space. There will be a limit on shed height, although it is less standard. It can be linked to a certain gap on overhead powerlines, or fence heights. If you have a HOA (Homeowners Assocation) they will have stricter rules on this than the City or County. If you live in an area susceptible to harsh weather conditions (i.e. Tornado Alley), you may need to get a permit so the city or county know your shed can withstand those weather conditions. But even in areas that have moderate climates, the City or County may ask you to build the shed to a certain standard, (i.e. 4″ thick reinforced concrete slab for the foundation.) In this case they may send someone around to inspect the building, (like they would with a house) to see it done to their standards. If you are connecting water and/or electricity you will most likely need a permit. If you plan on working out of your shed, and using it as a place of business, then you will again most likely need a permit. 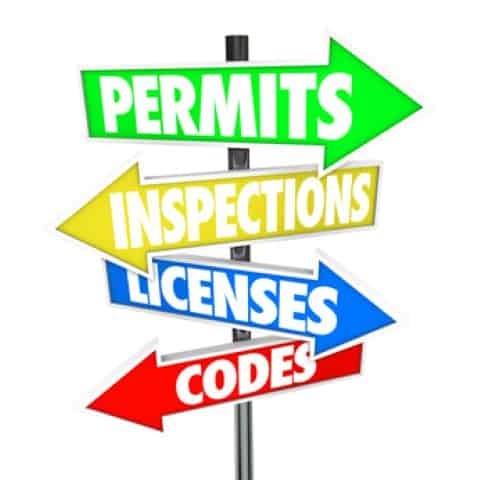 What Do You Need to Do to Get A Permit? There is no doubt that getting a permit is a hassle. The paperwork, added time and extra money required CAN TURN PEOPLE OFF putting up a shed altogether. Unfortunately, for the DIYer there is no real shortcuts. Knowing the system does help but if you are applying for permits once every 10-20 years, its always going to feel like a first time. If using one, and the contractor will typically provide it. Owner builders will have another form to fill in. Who is responsible for getting a permit? Where do I get my permit application and other information? Who do i talk to at the planning department? How long does it take to get a permit approved? What if I am in a HOA? Homeowners Associations (HOA) are usually more CONCERNED WITH THE LOOK of the development, rather than the structural stability. Shed's may be restricted from being visable from the street, which means no shed higher than the fence line. No sheds in certain areas, like the front yard. Although some city and council's do have a say about this, it can come up in the HOA rules as well. And you wonder why people use storage units! It certainly is a lot of stuffing around for not much.